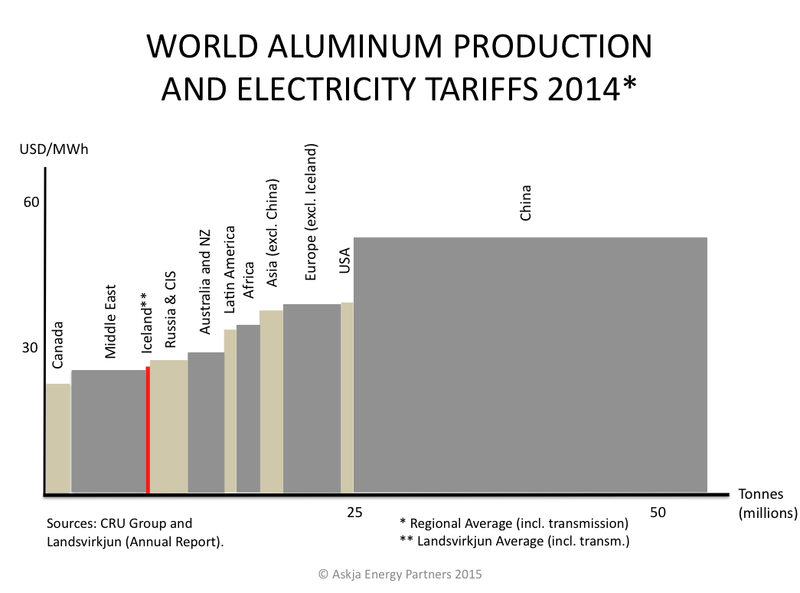 China has become the world’s largest aluminum producer. This is an interesting fact, not least when having in mind that the smelters in China pay on average much higher electricity tariffs than smelters elsewhere in the world. Iceland is represented by red color on the graph. Note that the column for Iceland includes only the power sold to smelters from the National Power Company (Landsvirkjun). Two other power firms in Iceland also sell power to one of the aluminum smelters in Iceland (there are three smelters in Iceland, owned by Alcoa, Century Aluminum, and Rio Tinto Alcan). However, Landsvirkjun is by far the main electricity provider for the smelters in Iceland. Thus, the average electricity price to the aluminum smelters in Iceland is very close to the average price the smelters pay to Landsvirkjun. Which was just above 26 USD/MWh in 2014. Aluminum production in Iceland is relatively unimportant in the global context (about 0.8 million tons of the total of close to 54 million tons in 2014). What is more interesting, is the fact that the electricity price the smelters pay Landsvirkjun (the average price) is one of the lowest in the world. In 2014, it was close to being exactly the same as the average price to smelters in the Middle East (which are mostly smelters in the Persian Gulf States, taking advantage of very cheap electricity from natural gas power stations). And the average price to smelters in Iceland is only slightly higher than the average price to aluminum smelters in Canada, and much lower than the tariffs to smelters in the USA. However, the average price to aluminum smelters in Iceland is likely to increase substantially in the coming years – when major contracts are up for renegotiation. Next such power contract is a contract between Landsvirkjun and Century Aluminum, regarding the Norðurál Smelter at Grundartangi. The present contract expires in 2019.